I honestly do heart this sweater. I love lots of things about it, and at the risk of sounding very self-congratulatory, I'll elaborate. 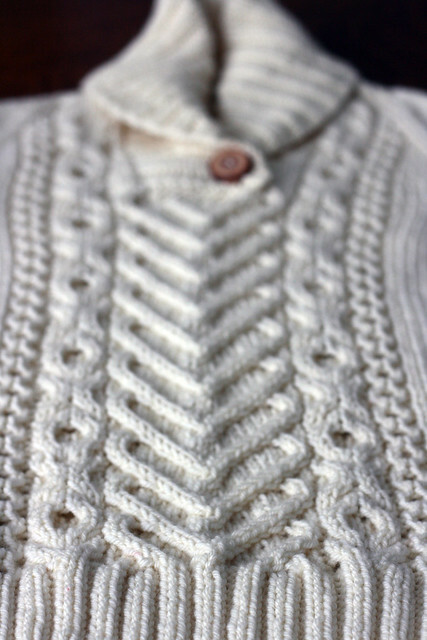 I love that I took a cable that I think is really pretty and re-engineered it to work for my sweater. As I mentioned before, the cable in the sweetheart socks that inspired this project was knit top down, and was on a background of reverse stockinette stitch. I wanted to knit my sweater from the bottom up, and I wanted the cable to be on a background of stockinette stitch, just because that's a look that I'm into right now. Once the heart cable was established, I decided that I wanted to really go with the love theme and picked a cable pattern that looks like x's and o's to border the central hearts. Then, another smaller scale cable was added to the outside to balance out the proportions and I was all set. The shawl collar was Chris's idea and I think that it's one of the best parts of this sweater! I had originally wanted to knit a sweater with a big cowl turtleneck, but once I had decided on the cables I changed my mind about that. Chris suggested the shawl collar, I took it one step further and added a button. Working with the undyed Green Label Aran weight yarn was really neat. I'm so used to working with my colourful yarns, and usually it's the colour that I'm focussing on, not the yarn itself. But this project was really all about the yarn, and it's made me love the aran weight base even more than I already did. It really is lovely to work with. Now comes the WIP part. Though I am thrilled with this sweater and I have already gotten a ton of wear out of it, I still consider it a WIP. I want this pattern to be my first sweater pattern, but before that can happen it has to be perfect, and unfortunately, it's just not there yet. I have one issue with this sweater, and that's the way that the cables just kind of end at the shoulders, I don't like the way that the x's and o's cable fades away at the top, it seems unresolved to me. I need to figure out how to fix that before this pattern will be officially done. I have a plan and I'm working on it, hopefully I'm clever enough to get it done!